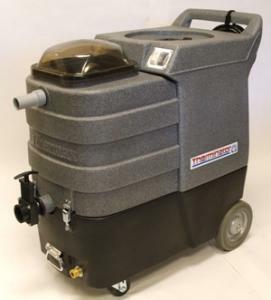 The Therminator CP12-DV is Thermax’s newest industrial steam cleaner, which aggressively removes dirt, grime, odors and other embedded pollutants with unmatched efficiency. Powerful dual two-stage vacuum motors (165” water lift) for faster cleaning, increased recovery speed and quicker drying time. Built-in 1800-watt solution pre-heating system for quick, uniform temperature control (up to 175°). 11-Gallon hygienic stainless steel solution tank. 12-Gallon large capacity recovery tank with automatic overflow protection shut-off and waste gate empty system. Single 25' power cord for one circuit operation. 100 psi high-efficiency demand solution pump (65-psi pump option available for auto detailing). Engineered for mobility and stability, tip resistant operation. Built-in dolly handle for greater control and maneuverability. Large 8” rear wheels make it easy to go up and down stairs.